How lucky is your Tet money? It’s a dicey subject – get it wrong and people will whisper behind your back. You’ll be labeled stingy, a tight-wad, or worse…scrooge! If you get it right, people will sing your praises to heaven and magically move out of your way in the traffic. 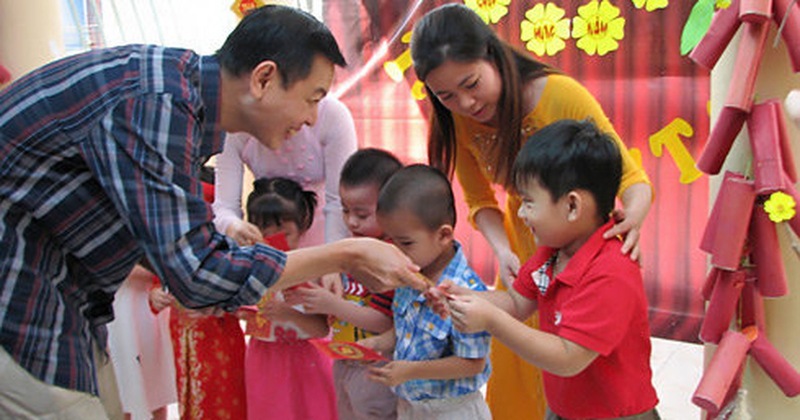 It’s a kid’s tradition for TET: giving small children ‘li xi’, or lucky money, in red envelopes. According to folk lore, there was a monster that used to harass children and make them sick or cry. Some deities, after visiting some villages would turn into gold coins (sounds utterly plausible to me…). The parents wrapped the coins in red cloth (as you normally do…) and placed them under children’s pillows (the safest place in the house, obviously…) and hey presto, one legend becomes a custom! Thus li xi has become a way of expressing good luck and best wishes during TET. Although I’m sure it’s got more to do with keeping the youngsters busy and out of the parents way too! There’s no particular special day during TET for doing this – simply whenever the adults meet the kids. And plenty of foreigners get in on the act well. The red envelope serves two purposes; firstly to give the kids some privacy about their money and avoid conflicts when children compare how much they received and secondly the red symbolizes prosperity and lots of good luck. You’d think the Vietnamese would wear something red every day, wouldn’t you? So if the children are from a well-off, extended Vietnamese family, it’s likely they’ll end up making a killing by the end of the holiday. As a gift and a symbol of good luck for the coming year, children are reminded not to spend it all at once and the smart ones save it up for clothes and other goodies later on. For poorer children in rural areas, it’ a tough gig and you would be very lucky just to receive any money! What I find to be a nice gesture is the willingness of young adult Vietnamese to gather clothes, school supplies and lucky money for these kids. Traveling up into the countryside to deliver these gifts reflects on the good character of the adults and some part of the cultural aspect of caring for those worse off even in a nation where life is tough anyway. Sometimes parents will upgrade a lot of the kid’s wardrobe, splashing out on new clothes and accessories. Some of my former younger students used to express frustration at waiting so long for new clothes, particularly older kids wanting to look good when they go out with their friends to the movies or the game centers. When I first arrived and settled in Vietnam, I used to give kids about a dollar in an envelope. What surprised me was how many asked for more! I don’t think it’s a selfishness thing usually. Occasionally they are prodded by their mates into these demands or simply wonder why grandpa gave them five dollars but the ‘rich’ foreigner only gave them a dollar. Foreign money goes down well, especially American currency but you’ve got to watch this; my teenage students sometimes complained when I gave them Australian one dollar coins! Other weirdness around TET involves gifts other than money. One time, a high school student of IELTS gave me a massive box of…shampoo. Was he trying to tell me something? Was it an unwanted gift from an insensitive relative? Maybe the kid’s mum thought I was too poor to buy the stuff. At least I was able to save on bathroom goodies that year! Maybe this is what you give the relatives and friends low on your pecking order. Combo boxes of soap and toiletries, huge boxes of el cheapo cookies and bonus packs of nappies all seem to be popular items judging by what’s on prominent display at the front of the local shops; an act of not too subtle revenge maybe? If that’s the case, I’d rather have the one Australian dollar in a glitzy envelope, please!